Think Tri! eat, sleep, everything triathlons: Operation Phoenix, a better prepared military. Operation Phoenix, a better prepared military. Whether you are pro or con USA Military making sure that in any event they are well prepared can only help, them and the USA. 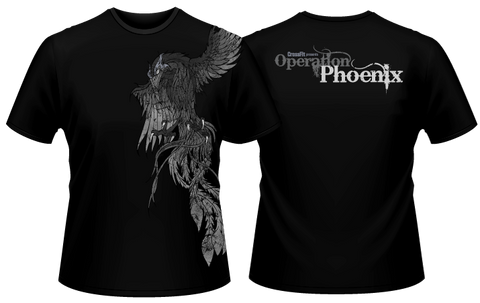 "Operation Phoenix is a CrossFit initiative that will raise the necessary funds to equip the entire United States Marine Corps with functional fitness equipment to increase combat preparedness, reduce injury, and strengthen unit cohesion. This will be accomplished through non-profit sales, corporate sponsorships, and individual donations. Every penny raised will go directly to "America's Fighting Force," the USMC." "Your help in support of Operation Phoenix not only increases Marines' fitness levels and fosters Marine Corps’ camaraderie, but positions corporate sponsors for networking, PR, and advertising opportunities within the CrossFit community. Additionally, you will find satisfaction in meeting and/or reconnecting with Marines all over the world. According to Coach Greg Glassman, the Corps has been the branch of the military to most rapidly adopt CrossFit into its fitness program. There is a CrossFit gym on or near practically every Marine Corps base in the country, and even one serving troops based in Okinawa, Japan. This is a chance to become a large part. To put into perspective the population size Corporate Sponsors will be reaching, CrossFit.com sees over 3 million unique computer visits per month. (Many of these computers are shared by several Marines and service members throughout a given day.) Furthermore, CrossFit.com pushes over 50 Terabytes of data per month, with an average time per site visit spanning just over 12 minutes. The community is enormous, and this is your market." Cross fit is sweeping the Nation and it does not matter what you are trying to accomplish, being an endurance athlete use CrossFit to build a strong, more balanced body.